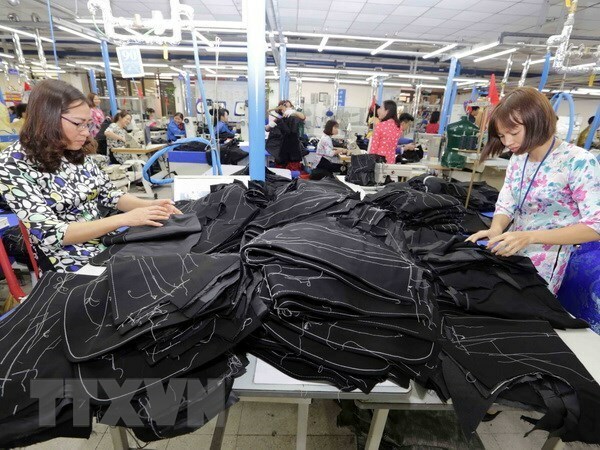 Hanoi (VNA) – Labourers working in the garment-textile sector earn the lowest incomes in Vietnam, despite the industry having the second-largest export value, an official from the Vietnam General Confederation of Labour (VGCL) has said. Employees in this sector have struggled to make ends meet as their income has failed to meet their basic needs, Le Dinh Quang, deputy head of the VGCL’s Department of Labour Relations, said at a workshop in Hanoi on April 11. This is the reason why the highest rate of demonstrations were staged by garment workers, he said, adding that up to 84 strikes were reported in the sector last year, making up 39.25 percent of the country’s total number. Echoing Quang’s views, Kim Thi Thu Ha – Managing Director of the Centre for Development and Integration (CID) that co-organised the workshop together with the Fair Wear Foundation – said garment labourers have led unstable lives and they have no choice but to cut their expenses as much as possible and work extreme overtime hours. Their reliance on overtime pay, rewards, and allowances is tied into other issues, including low productivity, discrimination, violence, assault, workplace accidents, family and health problems, she pointed out. Ha said the basic needs of employees should be an important and prerequisite factor in setting the annual minimum wage level. Annabel Meurs, Vietnam country manager for Fair Wear Foundation, said issues regarding productivity, collective bargaining, and global competition have resulted in garment workers’ low wage. However, one of the most important cause lies with the irresponsibility of employers, she stressed. According to a survey conducted by Oxfam and the Institute of Workers and Trade Unions, up to 69 percent of garment workers interviewed said they do not have enough money to cover their daily needs, while 31 percent are unable to build any savings from their salaries. Meanwhile, 37 percent said they are constantly having to borrow money from their friends and 96 percent have never or rarely visited restaurants. Of note, 23 percent are living in temporary houses and 44 percent are using wells and rain-water.